Andy Ockershausen:This is Andy Ockershausen, and this is Our Town. I have a great opportunity for me and my knowledge, which then it makes our audience more knowledge, but to find out about a name that’s been around Washington for years that’s very famous but unknown, that’s David Wilmot. David is an attorney, not a lawyer, an attorney. He’s from a law firm Harmon & Wilmot. He’s an expert in local government, corporate and commercial real estate development, promotion of minority and small business. David, you’re involved in everything. Did I not know until today and hearing your name and knowing you for all these years, you were born in St. Martin? David Wilmot:	Yes, that is correct. Andy Ockershausen:	Janice and I, I took her to St. Martin’s two years ago. They had the terrible hurricane go through there. David Wilmot:	We live on both sides. David Wilmot:	When I was growing up, there were only 5,000 people on the entire island. It was primarily farming. Some time in the late ’60s, we started moving towards tourism. It’s one of the premier tourist destinations. Andy Ockershausen:	I was on board of a National Associations of Broadcasting. We had our annual meeting in La Samanna. It just opened. In fact, they were still whitewashing part of it when we were there. That must’ve been in 1974 or something like that. David Wilmot:	It would’ve been around that time. That’s absolutely correct, because when I was growing up, the only hotel we had was the Little Bay Hotel. We only had one hotel on the island. We had two guest houses, The Passing Gram was one of them, and Delito was the other. Andy Ockershausen:	In our island in the sun. It was a magnificent vacation. I’ll never forget the airport, David. I’m sure it’s still that way. I didn’t think they’d get that airplane off the ground. It took off right over a mountain. Andy Ockershausen:	Is it still there today? Andy Ockershausen:	They can do it. Get off the ground easy enough. David Wilmot:	Get off the ground quite easily. Andy Ockershausen:	David, you’re born and raised in the islands and you went to school. How in the world? David Wilmot:	Let me correct one thing. I wasn’t actually born in St. Martin. I need to share that with you. My parents and grandparents went to a place called Panama to work on the Panama Canal. David Wilmot:	My father and his father and grandfather came from Jamaica to Panama. My mother and her family came from St. Martin to Panama. I was actually born in Panama in Gorgas Hospital on the canal zone. Andy Ockershausen:	That’s the famous name, Gorgas, right? David Wilmot:	Exactly. Then raised between Panama until I was 12. My father died and then we went back to Jamaica for a brief period, and then to my mother’s home in St. Martin. Then I came to the United States at age 17. David Wilmot:	To the mean streets of New York City. Andy Ockershausen:	What a wonderful background, though. You had Jamaica, and you had Panama, and you have St. Martin. David Wilmot:	That’s why we’re multilingual. Andy Ockershausen:	You do it all. David Wilmot:	I went to Dutch schools, so I can say . . ..
Andy Ockershausen:	Speaking the Deutsch. Andy Ockershausen:	The Black Dutchman. I like that. The Flying Dutchman. Did you go into the Air Force after you moved to New York? Andy Ockershausen:	You were a citizen. David Wilmot:	You get a green card. You’re not a U.S. citizen because it was a territory. Then that was returned back to Panama many years later. As soon as I turned 18, I got my notice to report. Funny story, I didn’t think that I was going to be going into the military that day. I just went down to 38 Whitehall Street, which at the time was down in Manhattan. They have all of the branches there, the Army, the Air Force, the Navy, the Coast Guard. David Wilmot:	Exactly. Then you had a choice. What influenced me more than anything else was that the Air Force was four years, but they had an educational component. Since I had not gone to high school, I wanted to be able to do that. Andy Ockershausen:	You had the education, but you didn’t have the degree. David Wilmot:	Didn’t have the degree. Andy Ockershausen:	That’s right. David, you picked the Air Force at that point, then. Andy Ockershausen:	I’ve heard of that operation, Bootstrap. David Wilmot:	No, no. Initially, I went to basic training at Lackland Air Force Base in San Antonio, Texas, and then from there I went to a technical school in Amarillo, Texas. Then I was stationed at Little Rock Air Force Base in Jacksonville, Arkansas. Andy Ockershausen:	You had a toast to the Southwest also, too, right? David Wilmot:	That is correct. David Wilmot:	I became “The Black Dutchman,” yes. David Wilmot:	It was very interesting because going to Arkansas, I had never been to a place where, as an African-American, I could not participate in any of the activities outside of the base. I couldn’t go to The Holiday Inn, I couldn’t go to the skating rink, I couldn’t go to Krogers or the Piggly Wiggly. Andy Ockershausen:	Was this the ’70s? David Wilmot:	This was in the ’60s. This is ’63. Andy Ockershausen:	Jim Crow was still alive then. David Wilmot:	Very much alive. I couldn’t sit in The Greyhound bus station, as a matter of fact. Andy Ockershausen:	You handled it, of course. David Wilmot:	We had to. Andy Ockershausen:	You got along. David Wilmot:	To fast forward a bit, I was the first African American along with Joe Nunn, my roommate, attending the University of Arkansas at the Little Rock campus. They had graduate students, my father-in-law included. He’s a lawyer. He went to the law school back in the ’40s. He went to law school with … I don’t know if you knew Wiley Branton. They refer to them as the legal pioneers. Andy Ockershausen:	I know the name. David Wilmot:	Ambassador Haley. George Haley, Alex Haley’s younger brother. They were all part of that class. Andy Ockershausen:	David, what a fabulous background. You’re telling me things all these years I’ve been listening and following you in the press and so forth, nobody ever told me before. This is great knowledge. I’m sure your partners know it and people you live with. How in the world did you get from United States Air Force, obviously, you were promoted and a part of it, to be teaching at Georgetown? This is incredible. David Wilmot:	Prior to teaching at Georgetown, I came out of the Air Force. I completed my service on July 18th, 1967. Got married and had a baby on the way. Andy Ockershausen:	In Little Rock? Andy Ockershausen:	Is she a native of Arkansas? David Wilmot:	Native of Arkansas. I was invited to meet her parents, which is the proper thing to do. They were having a big barbecue. When I arrived there, my mother-in-law will confess that she fell in love with me the minute she met me. She said I was so polite. Andy Ockershausen:	You were an islander. You were very polite. David Wilmot:	She said polite and very good looking. Andy Ockershausen:	I know that. For years. Andy Ockershausen:	I remember that name very well. McKissick. David Wilmot:	When I went back to the base and I told my friends that I had met Thurgood Marshall, they said, “You did not.” We only read about these folks in Jet Magazine or in Ebony. David Wilmot:	That influenced, inched me towards me thinking about law school. Coming out of the military, I had become very, very close friends with a gentleman by the name of Jack Merryweather. Back in Arkansas before the Waltons, the Merryweathers owned everything. They owned the Arkansas Gazette, they owned the Democrat, they owned the bank, they owned Arkansas Aviation. Andy Ockershausen:	I can relate to that. David Wilmot:	Jack said that he had spoken to his dad and his dad said that Mr. Murphy, who was then the city manager of Little Rock, was going to be retiring and Jack was going to be getting that position. 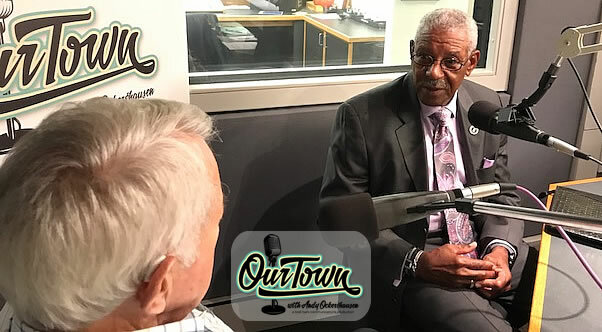 David Wilmot:	Jack said to me, “You’re going to be my assistant.” I was the first African-American to be hired in a major administrative position in the city of Little Rock. I would say to you that my first day on the job, I went to the elevator. Back then, elevators were all operated by black women, very nattily dressed with their little white gloves. She said, “Young man, where are you going?” I said, “I’m going to the fifth floor.” She said to me, “Colored people don’t go to the fifth floor.” I said, “Ma’am, trust me, I’m going to the fifth floor.” Fortunately, for both of us, and everybody concerned, here came Jack. He was ecstatic that I was there and gave me a big hug. Word got around city hall very, very quickly that I was African-American. Andy Ockershausen:	That’s something they’re very proud of, I’m sure. David Wilmot:	No. The council said they wanted him to withdraw the offer. Andy Ockershausen:	That was the beginning of things changing in Arkansas, of course. Andy Ockershausen:	The timing and everything at the time. I don’t want to interrupt, but did I remember that Bobby Mitchell, the great Redskin was born in Arkansas? Andy Ockershausen:	I thought Bobby was from Arkansas. I don’t know how they’re doing now. His health was not good the last time I saw him. David Wilmot:	I haven’t talked to him in a long time. Andy Ockershausen:	He and Gwen moved out to the suburbs. Anyway, back to you, and the exciting time you’re going through in Arkansas. Then, it’s still a long way from the University of Georgetown or Georgetown University. It’s still a long way from the East Coast. David Wilmot:	So many students from foreign countries. That’s the place I wanted to be. I was very fortunate to be accepted to Georgetown and several other law schools. I made the decision to leave to come to law school in 1970. David Wilmot:	In 1970 I enrolled at Georgetown. Andy Ockershausen:	You hit the city when the change was coming. Big changes were coming in Our Town. Andy Ockershausen:	We’re having a delightful conversation with David Wilmot. Our Ken is a Southwest, as you can see. He’s Oklahoma State. David Wilmot:	Oklahoma State, huh? Andy Ockershausen:	We got you into Washington in 1970. We’ll be back. This is Our Town with David Wilmot. Andy Ockershausen:	This is Andy Ockershausen. This is Our Town. We’re very, very happy and delighted that David Wilmot is with us. He’s telling us about his beginnings in Panama, the islands. He saw the world and he got the world in the Southwest the University of Arkansas, and then he decided to come East. He did in 1970, came to Georgetown as a student. David Wilmot:	As a student. That is correct. Andy Ockershausen:	You must’ve been one of Ed Williams’ pupils. Was he teaching then. David Wilmot:	He was teaching in the evening program. David Wilmot:	Downtown. As you recall, it was on E Street between Fifth … As a matter of fact, we came looking for the law school, and we went around the buildings because there was no campus. Andy Ockershausen:	I know. It was just there. David Wilmot:	Exactly. It was a wonderful opportunity, and there were some wonderful people there. Adrian Fisher, I don’t know if you know the Dean of the Law School, Executive Vice President Dean. Andy Ockershausen:	So many good names that I remember. David Wilmot:	Wonderful man who was quite accomplished. He was from Tennessee, from Memphis. We had the Memphis and Arkansas connection. Andy Ockershausen:	Right. Tennessee and Arkansas. Andy Ockershausen:	David, being in Georgetown in those years and working, of course, Vietnam was hot then in 1970. David Wilmot:	A demonstration every weekend. Andy Ockershausen:	Always. Our Town was caught in the middle of a lot in those years, David. You were part of it. I was part of it. WMAL was a big part of it. The city grew up, and the country grew up. Having you here was so important to Our Town because it enabled you to meet a lot of people and do a lot of things that I don’t know if that opportunity still exists for young people, but I’m sure it does. You got connected during those years. Andy Ockershausen:	They needed tutoring. David Wilmot:	Exactly. They needed a lot of things. Financial aid and that sort of stuff. It was sort of an act of defiance because initially, nobody responded. Andy Ockershausen:	I’m sure you made your point, though. David Wilmot:	I crashed the faculty meeting that was being convened. Andy Ockershausen:	Did they ever bring these 10 back? Andy Ockershausen:	You were rocking the boat, David. David Wilmot:	We rocked a lot of boats those three years. Andy Ockershausen:	She wasn’t Eleanor Holmes Norton then, was she? David Wilmot:	With Ed, but she was on the Civil Rights Commission at the time. Andy Ockershausen:	That’s right. I remember that. Andy Ockershausen:	David, you’re rocking the boat. David Wilmot:	That’s what you should do. Andy Ockershausen:	You did it fair thee well at Georgetown, then you began the rock the boat for the city. David, you met a lot of the characters. I was reading in the Post this morning about Vince Reed, who was a great local character. David Wilmot:	He was my guy. Andy Ockershausen:	There was David Clarke in the picture. I haven’t heard that name for a year. David rocked it too. Andy Ockershausen:	Rode his bike around town. Andy Ockershausen:	He was in the ’70s, right? David Wilmot:	Oh, yeah. David would ride his bike to every destination, whether it was in the far southeast or northeast or wherever. He’d come on that bike. Andy Ockershausen:	We could see him all over town. Remember he had a storefront law firm? Andy Ockershausen:	The city was going through periods at that time, David. I wasn’t an insider, but I was outside the inside looking in between of WMAL. We were close to all the characters and the people that make this Our Town so great. We watched this whole thing with our city was changing so dramatically in the administration and the government. You were a big part of it. Andy Ockershausen:	With a lot of good people. David Wilmot:	Part of it is I have to give a lot of credit to a significant number of people who, in my opinion, empowered the next generation, my generation. Walter Washington, who I had a father-son relationship with him, appointed me to one of the most powerful boards in the District of Columbia, 29 years old. I was 29 years old when he did that. David Wilmot:	Right. It was the Wage and Hour Board. David Wilmot:	We set all the minimum wages. I got to meet Nick Antonelli and Bud Doggett. Andy Ockershausen:	All the movers and shakers. David Wilmot:	Joe Riley. We’re setting minimum wages. I’m at the Board of Trade talking to them about the domestic wage order, or something like that. I can’t tell you how that transformed my career as a lawyer, but my relationships. A lot of what I’m trying to do right now is to do exactly that. I’m on a youth movement trying to empower the generation behind us and the one behind them. Andy Ockershausen:	They’re coming, and they got to be recognized. The world has changed so dramatically. Our millennials, which is a name I never even knew what it was until 10 years ago. David Wilmot:	We got to give them an opportunity, because to my chagrin, and I’ll talk about the good and a bad. When I came to Washington, there were six legitimate black law firms. Today we have one. I don’t know if you remember Turk Thompson and Paul Webber and all of those. Architectural design engineering firms. We had 12, I think. Now we have two. Financial institutions. We had Independence Federal. We had Billy Fitzgerald and Sam Foggie over at United. Today we have one. From my perspective, it seems that we’ve made some progress, but we’re going backwards. Andy Ockershausen:	Don’t forget, I think David, that a lot of these things moved to Prince George’s County, which has become very prevalent a black community compared to what it was. Those good law firms are out there now. David Wilmot:	No. I’ve trained a lot of these lawyers, and the thing that troubles me more than anything else, is that they’re sole practitioners. That’s what I’m trying to do now, is I’m trying to get them to realize the value in a partnership and what that portends for them, both professionally and financially. Andy Ockershausen:	You’re in trouble. David Wilmot:	I want them to be more integrated in all of the opportunities that exist in our community, because there are many, and not to be on the sidelines. I want them to show initiative. I think what we did in terms of my older kids, is that we raised a generation of young people who have a sense of entitlement. The millennials, and I’ve got four of them, they’re not waiting on anybody. They know what they want to do and how they want to do it, and they’re fiercely independent of thought and action. I love that. Andy Ockershausen:	They’re very independent. Four boys? Andy Ockershausen:	They didn’t provide anything for you. It’s all up to you. Andy Ockershausen:	Then we’ll furnish it. Andy Ockershausen:	Love that. That’s entrepreneurial. That’s you, though. David Wilmot:	That’s who I am. Andy Ockershausen:	You can be proud of that. We’re talking to David Wilmot. This is Our Town, and I want to explore his relationship with the city and with our city government, and with Uncle Sam. We’ll be right back with some more words with David Wilmot. Andy Ockershausen:	This is Andy Ockershausen, and we’re talking to David Wilmot about Our Town. He’s been such a big part of Our Town when he arrived here in 1970. David, I hate to tell you that, but we’re getting close to be 50 years here, seen here in Washington. It’s been a momentous time for Our Town. Andy Ockershausen:	I think the big thing came when Walter Washington was appointed mayor, as you know. Andy Ockershausen:	Then he won one time. Walter was such a big part of Our Town, and did so much for it. He was a good mayor, but he was also a good man. He knew the value of the business community. David Wilmot:	Oh, no question about that. Andy Ockershausen:	To make this thing hum. David Wilmot:	One of the things that happened, is that we moved towards doing a convention center. Andy Ockershausen:	Visitor and convention, right? David Wilmot:	Right. It’s very interesting how we fall into these roles. I don’t know if you knew Ed Singletary. He was with, back then, C&P, which is now Verizon. David Wilmot:	He was the Treasurer. David Wilmot:	No. Not the cable. Telephone. Andy Ockershausen:	Oh, the telephone. David Wilmot:	Verizon. The cable is separate. That came in ’81 and ’82. Andy Ockershausen:	That was before Bob Johnson, right? David Wilmot:	No. The convention center was before Bob Johnson, but we also were part of the Cable BET and DCI, was a member of that board. Going back to the Convention Center. The city had made a decision that we needed to build a convention center. They appointed a board that included Julia Walsh, Mrs. Walsh. David Wilmot:	All the people that you knew. Ed Singletary became the Chairman of that board. Ed and I are avid tennis players, and we would play tennis a couple times a week. Ed told me that he was just appointed to this Board. They gave him a copy of the law, and they took pictures with the Mayor. He doesn’t know what to do, because he doesn’t have an office. I said, “We’ll get an office for you.” Herbie, my partner, Herb Harmon and I, decided that we would help them. We wrote the rags and we did everything that was necessary to get the convention center started. They decided to have me come as General Counsel of the board of the Convention Center. I’m working with some wonderful people there to get the first convention center built. As you probably know, we didn’t have enough money to complete the convention center. Andy Ockershausen:	I knew that. David Wilmot:	Even after we put the building up, we didn’t have a kitchen. It was just dirt back there. We were creative in terms of extending a contract that allowed the successful bidder on the food service contract to be able to advertise. It cost a million dollars. Andy Ockershausen:	A lot of money they had to put in. David Wilmot:	And Dan . . ..
Andy Ockershausen:	A situation. Austin told me had a situation with a senator from Vermont. I said, “What’s his name?” He said, “Patrick Leahy.” I said, “I don’t know anybody in Vermont, but I got a friend on the Board with me. I’ll give him a call and see if he knows can he help us.” I called him. He had a radio station in Burlington. I said, “Are you familiar with Senator Patrick Leahy?” He said, “I’m his finance chairman.” I said, “Bingo.” We go to the hearing and Patrick introduced me to the crowd. I said, “I understand you’re a good friend to Frank Balch. Any friend of Frank’s a friend of mine. What can I do for you?” That was it. He became our ally only because I knew a guy from another state that had no relationship with Washington, but he knew me and he helped us. That’s the kind of thing that you did. It was knowing people and connecting the dots. David Wilmot:	That’s what we do, because this is a wonderful place to do that. Andy Ockershausen:	You have been a prime example of a dot . . .. That’s a positive. Stu, we talk about Stu Long. Stu was so helpful in a lot of ways running that little bar over in the southeast, as you know. Andy Ockershausen:	He had good friends. David Wilmot:	Always, and because he was a good person. Andy Ockershausen:	That’s right. He wouldn’t mind going to bat for you. Andy Ockershausen:	You were 33, 34 years old? David Wilmot:	I was 29. Andy Ockershausen:	When you were doing it. Andy Ockershausen:	You had good teachers. Andy Ockershausen:	And you did. David Wilmot:	I took the job. Washington is a very interesting place. It was in the newspaper shortly after I was appointed, and everybody that I didn’t know suddenly knew me. That included the Speaker at the time was Carl Albert. David Wilmot:	They live pretty good. Andy Ockershausen:	He was so powerful. David Wilmot:	He said, “Someone is going to join us,” and it was his roommate along with his son, who wanted to go to Georgetown Law School. I said, “Sure.” I explained to him the application process and all that. As soon as I got out of there I called my boss, and I said, “Just had dinner.” He said, “We’re going to take care of the Speaker, David. We certainly will take care of the Speaker.” I called my grandfather also, because I wanted him to know. He said to me, “Son, it really had nothing to do with you. The position that you’re occupying, treat it with humility.” I got to know every President, I got to know every Speaker. Tip O’Neill was one of my closest and best friends. David Wilmot:	One was Chief of Staff to the President. The Washington Post wrote a story saying that there’s the Georgetown Mafia. Andy Ockershausen:	It’s the University of Georgetown mafia. David Wilmot:	Bill went to the undergraduate school. David Wilmot:	Oh, yeah. I, to the law school, Tony and John to the law school. We had all of these folks who went to the law school and we were able to get the money needed to do the Subway reconfiguration on the new convention center. Andy Ockershausen:	That’s when the convention center was a Subway, right? David Wilmot:	That’s the Subway. Oh, yeah. Absolutely. Andy Ockershausen:	How were you involved when the Georgetown people didn’t want that metro, did they? They didn’t want the Subway. David Wilmot:	They didn’t want it, Colonial Village didn’t want it, and now that’s why we don’t have it. What we have, is that all of us are now Senior Citizens who sat in those meetings and said we didn’t want it, and we can’t drive much anymore, and they’re struggling to get up to Silver Springs to get to Subway. We’re always building for the future. I didn’t realize the future included us getting old. Andy Ockershausen:	Every time you go to Dulles now, you see what it took to get that going. They finally got that done. I hope somebody to ride that thing up there. I remember the opening. David, you’ve been such a big part of all these things. I hope you will write a book someday. You’ve got so many stories. I think this would be a great part of them too. David Wilmot:	I’m under a lot of pressure to do that. Andy Ockershausen:	You’re the only one that’s got the knowledge. We just got to squeeze it out of you as it is. I’m sure all your friends know you, but the public doesn’t and we hope this podcast will help illuminate that. This is Andy Ockershausen. We’re talking to David Wilmot. We’ll be right back. Andy Ockershausen:	This is Andy Ockershausen. Our Town. We’re talking to David Wilmot, a very important figure at Georgetown University and things he’s advised there to the law school and to the school. We have read with great interest about the reparations situation that Georgetown has addressed. I think it’s been a wonderful thing for Our Town and for our university. David Wilmot:	I think it is. I think that we need to applaud the efforts of our president of Georgetown University, Jack DeGioia, because rather than sit and ponder, he came up with a plan. Andy Ockershausen:	He’s an activist. David Wilmot:	That exactly what we need and all of this situations. These are very difficult situations, both for students, families, and others. When I spoke, I often say to students that, “You don’t need to be distracted by some of the things that we could not control and can’t control. Your primary obligation is that your parents spend a lot of money to send you to Georgetown. You go to those classes. Then think in terms of how you can make a difference, as we did when we were at the law school.” We can make a difference through our advocacy, through a plan, which is what Jack has done. He’s done something very, very comprehensive in terms of how we’re going to address that going forward. Can’t do anything about what happened in the past, but we can do a lot about how we construct a future that is devoid of any of the ills of the past. David Wilmot:	I’m confident that’s going to happen because he’s created a department, an entire department at the university that will be addressing this question. He’s invited scholars in, who will look at it. They’ll write books. They’ll teach. They will continue to look at solutions to some of these problems, because in all reality, right here in Washington, D.C., we have three generations of people who are trapped in institutionalized poverty. We’re almost going on four. It’s those kinds of things that we need to address. I can take you probably 20 minutes from here and there are African-American kids in our community who cannot speak the English language properly. Those are the kinds of things that we see every day and those are the kinds of things that we have to address. We have a considerable amount of money. We have a 14.8 billion dollar budget on a non-capital basis. I don’t think it’s targeted in the way it should be targeted, to addressing some of these. Then we have some policies that don’t make any sense. We have a policy of social promotion. I have a ten year old. If she fails to meet the requirements of the fifth grade, she’s going to repeat the fifth grade. In the public school system, that ain’t the case. You would pass and then you’ll get all the way the ninth grade and you have to pass the ninth grade. You only have fourth grade skills, so you fail. Those are some of the core things that we need to address. Andy Ockershausen:	The core values. David Wilmot:	Exactly. That’s what the university is concentrating on in terms of how we can reach outside of the walls of the university, which we’ve historically done. Georgetown has been very, very active over the years in not being just in the community, but being of the community. Andy Ockershausen:	Help move the community forward. I see that Gonzaga’s beginning to realize their problems in the school before it was a university, or before it was Gonzaga. They’re addressing it. Andy Ockershausen:	They’re talking about it. David Wilmot:	I had such an incredible respect for Father Novotny because, I don’t know if you remember Father Novotny, because he was a visionary. We’ve invested in Gonzaga. Rick Bennett, I don’t know if you knew Ricky. Andy Ockershausen:	All the guys. David Wilmot:	They’re a part of that effort. Andy Ockershausen:	David, it’s so important that this continue. I’m going to continue as long as I can, because Janice is so into this and so important to me and to this program. You are one of the leaders and we know that. We got to bring this next generation along. I try to tell young people there’s so much more to be involved in this town. It’s so easy to get involved. Get out there and get to work. I know you’re getting places. David Wilmot:	I started, along with some others, two groups. They’re the Rising Leaders and then there are the Black Executives, which we’re trying to get to look at the opportunities that are here to empower other people to access those opportunities. I sit on a bunch of boards all having to do we welfare with kids. Far too many. Janice Iacona Ockershausen:	53 zip codes. Andy Ockershausen:	We just started with these kids. Now they’re through graduates. They’re going to good schools and so forth. We repeat that every time in the city that we can. We help all the time in schools. It’s so important. Andy Ockershausen:	We think so. David Wilmot:	. . .been very fortunate. Andy Ockershausen:	Without churches, it wouldn’t be a country, I don’t think. Georgetown is a leading example of it. David, where do you go from here? You’re never going to retire, I know that. David Wilmot:	No. Absolutely not. Andy Ockershausen:	I know you’re having a wonderful life. You got so much to give. Andy Ockershausen:	To watch them grow. Andy Ockershausen:	They didn’t hand it to you. David Wilmot:	No, no, no, no. Andy Ockershausen:	Think of your grandfather every time you get that opportunity. Andy Ockershausen:	I was reminding Janice that my good friend Charlie Brotman, his 90th birthday next month, and he’s still going. He’s not as strong as he was, but he’s still involved. I stay involved with him. We have our group that gets together. We still try to help in a lot of ways in Our Town. It’s been so great in the sports world that we’re in. It’s been great in the government. I think that Mayor Bowser’s done a great job. David Wilmot:	She’s done an outstanding job. I’m in a youth movement, and she doesn’t get full credit for everything that she’s doing, because part of what you’re trying to do is to change a culture. Andy Ockershausen:	That’s what you’ve done, David. Andy Ockershausen:	Make it possible. David Wilmot:	Oh, yeah. I used to say to my staff, “We need to figure out every single day that we’re in this building, how we can make the lives of our students better.” Everything is possible. They used to say to me all the time, “Dean Wilmot, that’s the policy.” I would say to Barbara or to one of them, “Get me a copy of the policy.” I’m still waiting. It’s a custom. Andy Ockershausen:	It’s a culture, not a policy. I understand what you’re saying. It’s the way it always was. That doesn’t mean you can’t change it. David Wilmot:	We have a lot of very wonderful people here that have made such an important commitment to this city. They’re very quiet, but you can feel their energy and the value of the work that they’re doing. We need to applaud them as well, because if I took you to the Washington Tennis & Education Foundation center on Bennett Stoddard, you’ll see all the good works there. Andy Ockershausen:	You’re a fortunate man, and I’m a fortunate man to have grown up in Our Town and been associated with people like, you mentioned Bob Doggett. A mover and a shaker. Loved Our Town. Andy Ockershausen:	Devoted his life to it. Andy Ockershausen:	I hope they’re still around, those people like that. Andy Ockershausen:	They still are doing it and they’re in your life and my life, and I hope these young people realize that knowing David Wilmot is important. It’s important to me and important to Our Town. We thank you so much, David, for your conversation, and thank you so much for your service to Our Town and our country and our world. Andy Ockershausen:	Aren’t we lucky to have this, David? David Wilmot:	Thank you and thank your lovely bride there for allowing me to share a few words with you and with this community. Andy Ockershausen:	Thank you so much for what you do. This job’s for you. Janice will find out. We’ve been talking with David Wilmot with a wonderful conversation, and I thank everybody. I thank David so much for what he’s done for Our Town. This is Andy Ockershausen, and we’ll be back in the future with another Our Town. Announcer:	You’ve been listening to Our Town, season three, presented by GEICO, our hometown favorite, with your host Andy Ockershausen. New Our Town episodes are released each Tuesday and Thursday. Drop us a line with your comments or suggestions. See us on Facebook or visit our website at ourtowndc.com. Our special thanks to Ken Hunter, our technical director and WMAL radio in Washington, D.C. for hosting our podcast. Thanks to GEICO, 15 minutes can save you 15% or more on car insurance.